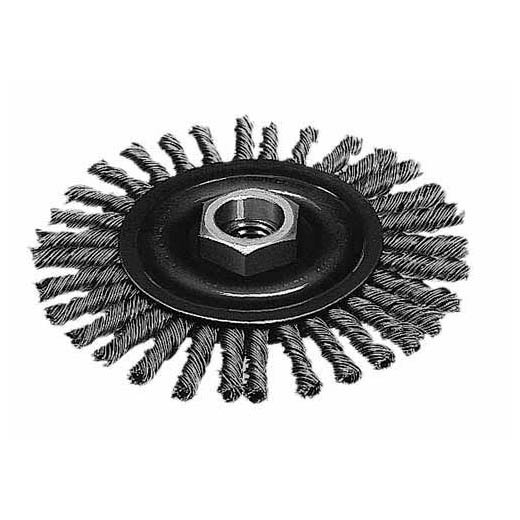 Milwaukee Hyperwire™ wire brush products offer faster material removal and greater life yet maintain a finer finsh. For maximum weld cleaning in confined area, the narrow faced Stringer Bead Wheel provides aggressive action. A tight twist provides the narrow profile with the required stiffness to clean pipe joints in fabrication shops and pipeline maintenance. Stringer Bead Wheels are available in both carbon and stainless steel. For maximum weld cleaning in confined area, the narrow faced Stringer Bead Wheel provides aggressive action. A tight twist provides the narrow profile with the required stiffness to clean pipe joints in fabrication shops and pipeline maintenance. Stringer Bead Wheels are available in both carbon and stainless steel. This Stringer Bead Wheel is designed for use on 4-1/2 or 5 inch Milwaukee Grinders (6145, 6146) with 1/2-13 threaded spindles. Made of carbon steel.